The last 48hrs have been glorious, cloudless skies backed with a stiff NE or NNE wind, despite the crystal clear conditions there were migrants to enjoy on land. The sea was pretty much neglected by us. Jamie and I attempted to cover as much of the headland as possible with Harry Witts joining us on the 20th. 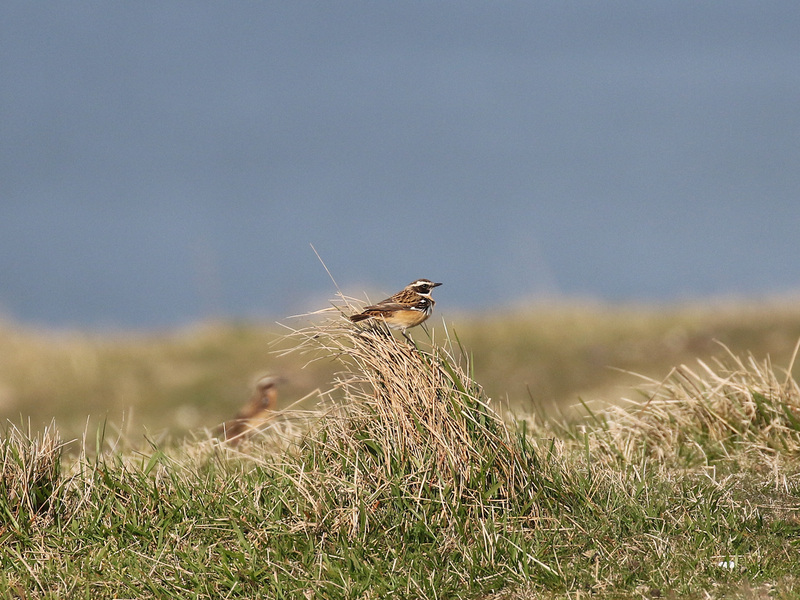 A big highlight of the last 2 days has been encountering 7 beautiful male Whinchat, a species I see little of in spring. Birds of note on the 19th included 18 Willow Warbler, 12 Common Whitethroat, 2 Whinchat, 2 Redstart, (all encounters of those two species late afternoon suggesting a late arrival of birds?) A late Fieldfare in Belle Tout Wood and most notable being a Spoonbill passing east, out to sea at Cow Gap during the early afternoon. 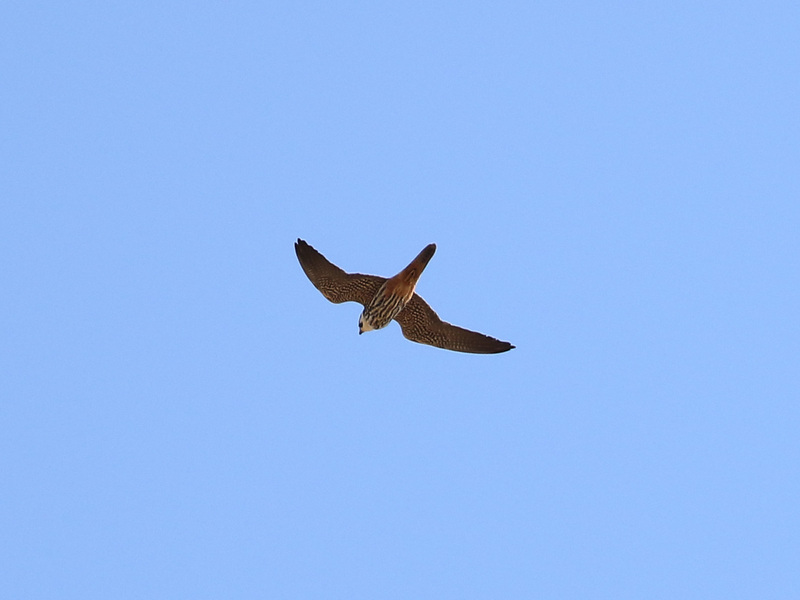 The first Hobby of the year over Belle Tout. The 20th produced more new arrivals despite the clear conditions. c12 Willow Warblers, c25 Common Whitethroat, 1 Lesser Whitethroat, 4 Tree Pipit, 5 Yellow Wagtail, 2 White Wagtail, 10 Wheatear (including the first females I’ve seen this spring), 5 Whinchat, 1 Hobby, a single Red Kite bearing a wing tag, all three hirundines were seen arriving in off the sea, c20 Swallow, c8 House Martin and c6 Sand Martin. 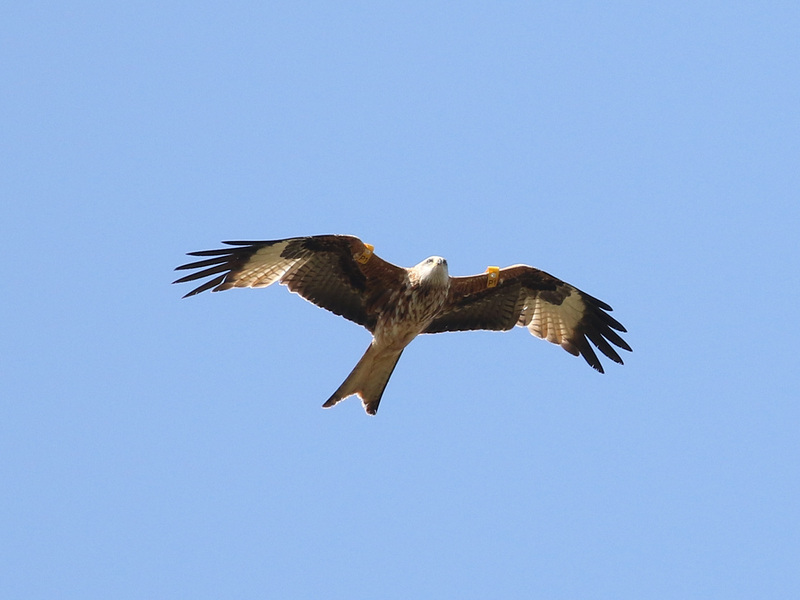 Wing tagged Red Kite. 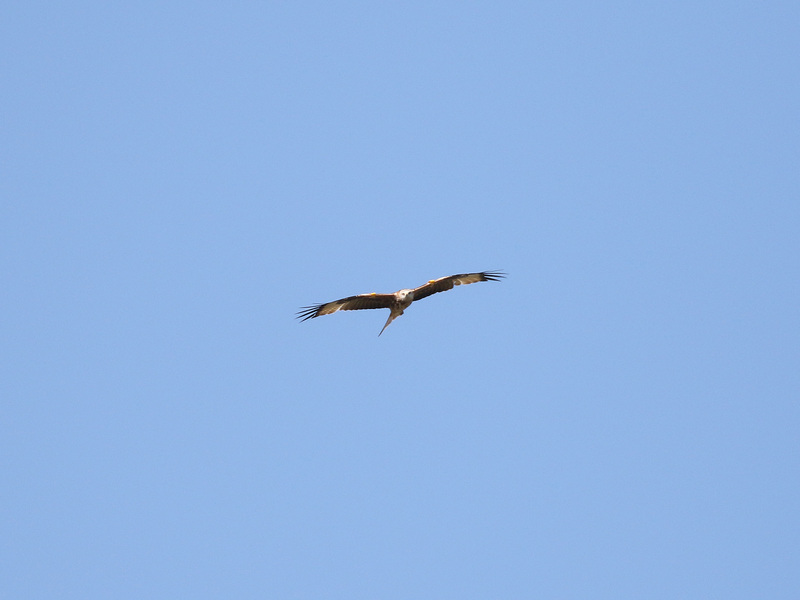 I eagerly await details of this bird as there is much speculation as to where coastal Red Kites come from. I firmly believe they’re British birds… will I be eating humble pie?! A still night followed by an equally calm morning with murky conditions. After 7 days of virtually no perceptible migration on land, good birds were to be had on land and sea. A great Mediterranean Gull passage this morning and the first Little Tern of the spring. 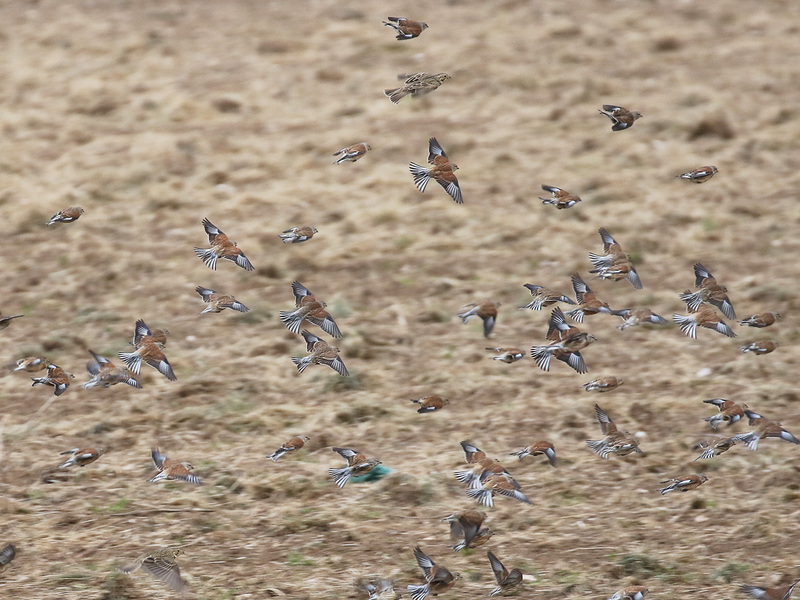 Lovely to see flock after flock of these immaculate birds. Due to poor visibility at sea, the approaching bird’s evocative call was often heard before appearing from the mist and fog. On land, overnight conditions conspired to produce the second significant fall of the spring so far. Combined totals (JFC, RAB, RE, LP) were; 80+ Willow Warbler, 2 Chiffchaff, 1 Sedge Warbler, 17 Blackcap, 2 Wheatear, 1 Black Redstart, 1 Common Redstart, 2 Short eared Owl, 12 Swallow, 1 House Martin, 3 Sand Martin, 1 Tree Pipit over & last but not least, two Jay around the pub first thing. Visiting birder Harry Witts continued to watch the sea after we packed up at 11am, pushing the total of Mediterranean Gull to an impressive 242. 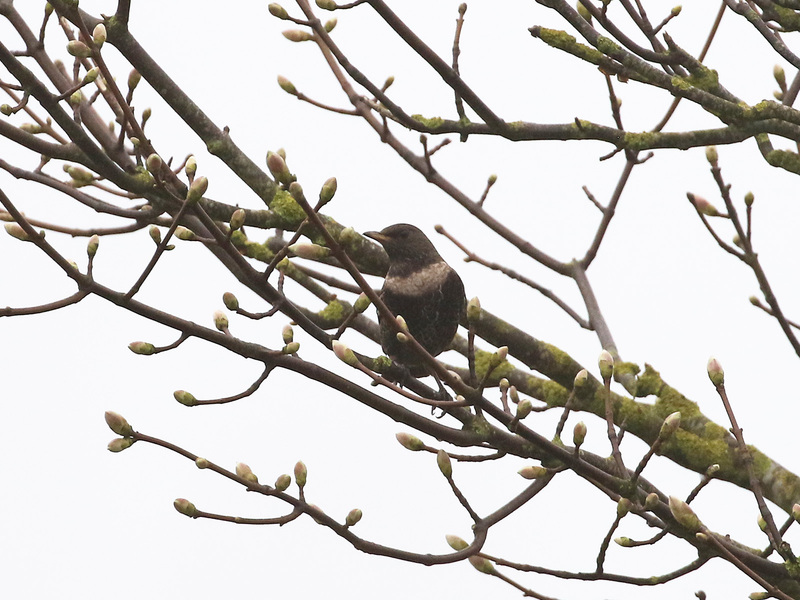 He also had the first Lesser Whitethroat of the year in the Hollow. Black Redstart near the mast. 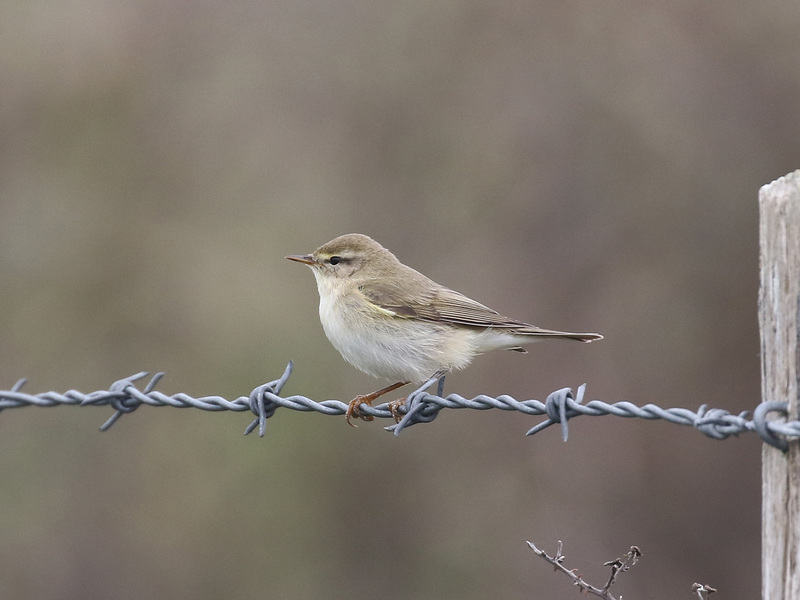 One of the many Willow Warbler today, this one early on near the mast. Adder near Belle Tout Wood. 8.4.19 Some long overdue migrants! A calm night and dawn with an almost imperceptible wind, coupled with an increasing amount of mist and low cloud towards dawn led to the best morning of the spring so far. Most sites covered today from 07.00hrs to 16.00hrs with Jamie. 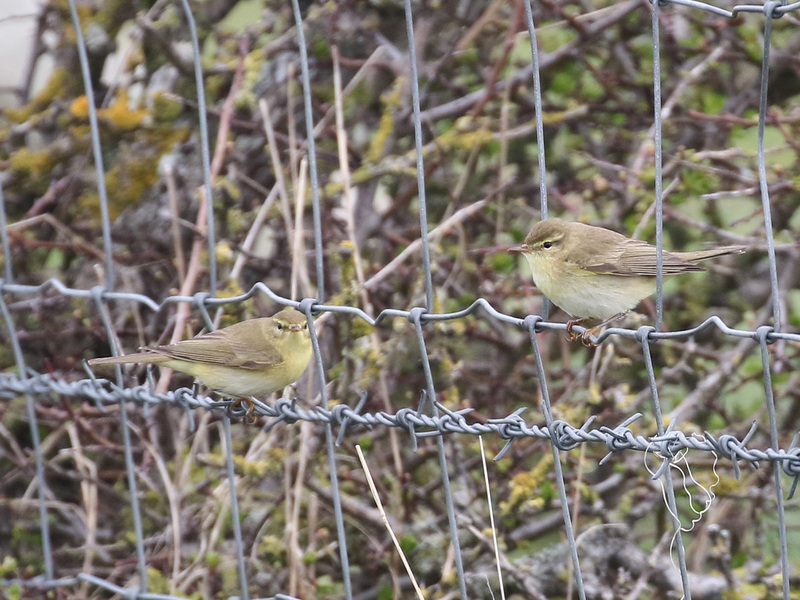 Willow Warblers along fence lines, one of my favourite sights of spring at Beachy Head. Willow Warblers, great variation amongst the birds this morning with many grey/desaturated individuals amongst more familiar yellow toned birds. Certainly something I have noted before here in spring. I had thought the previous night was too misty too soon to produce birds but upon arrival this morning it was clear there had been a decent fall of birds overnight, which had been long over due since the last decent “fall” on the 20th March. 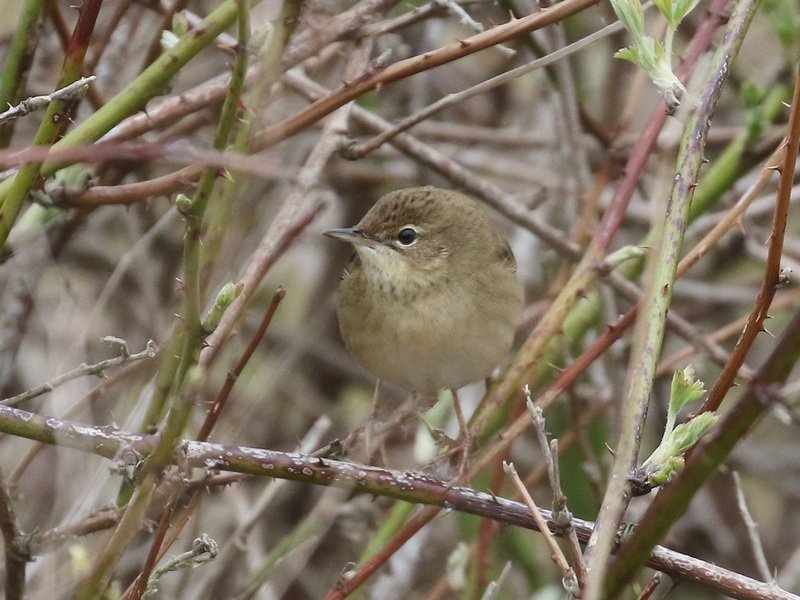 Along with good numbers of Willow Warblers it also included a number of seasonal firsts and a few winter thrushes (a few Redwing had been noted moving the night before) Totals included; 81 Willow Warbler, 13 Chiffchaff, 1 Whitethroat, 16 Blackcap, 4 Common Redstart, 3 Wheatear, 4 Black Redstart, 4 Fieldfare, 2 Redwing, 3 Ring Ouzel, at least 5 obvious migrant Song Thrush which departed high north with one of the Ouzel, 20 Robin, 1 Brambling, 1 White Wagtail, 2 Yellow Wagtail, 1 Firecrest, 4 Goldcrest, 1 Merlin, and a Greenshank over calling from the murk. 10 Swallow in. 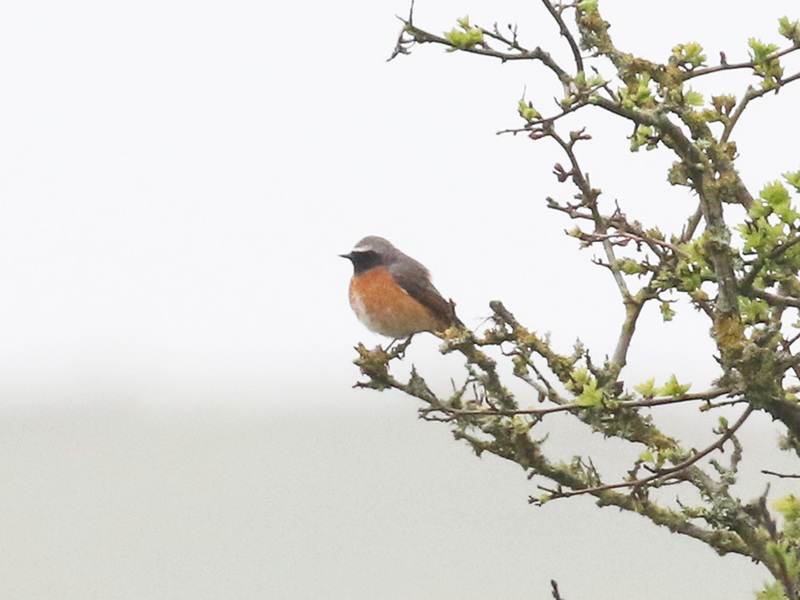 Common Redstart also around the top bushes. By “top bushes” I’m referring to patches of cover from the pub carpark east to the old trapping area. 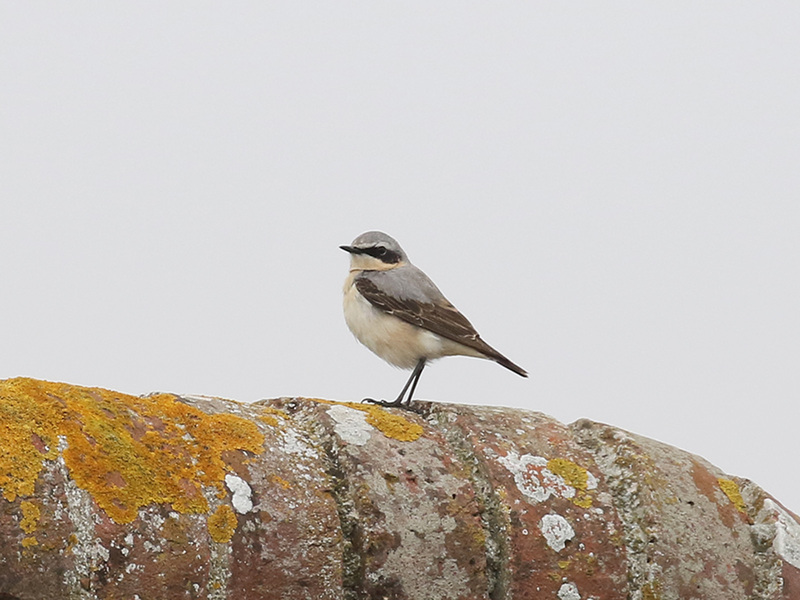 Wheatear on the lighthouse wall. 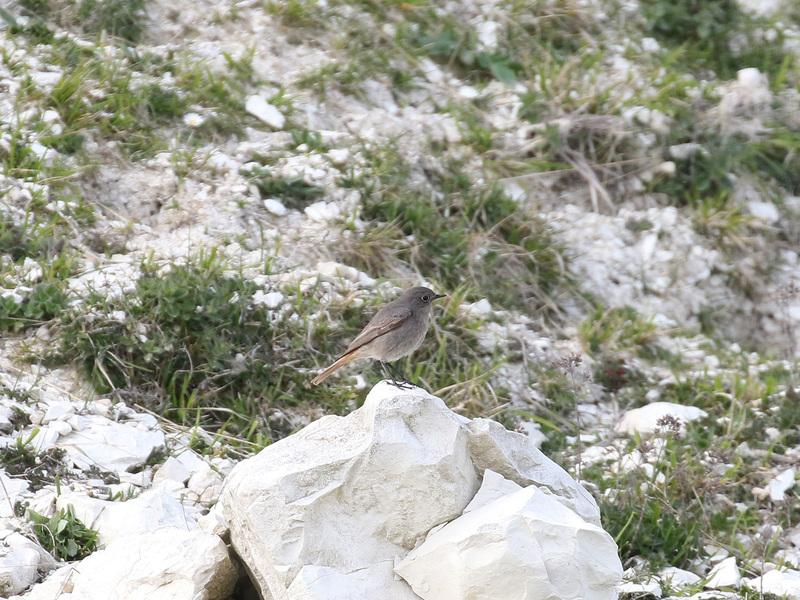 Black Redstart at Cow Gap. Working the bushes has been dismal the last few days, a couple of commitments have curtailed available time too. 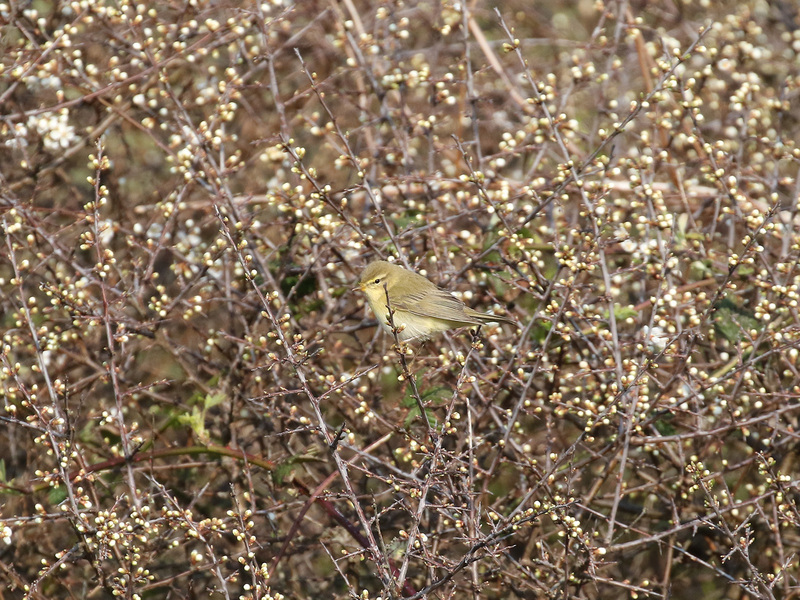 The only migrants I have seen are low daily numbers of Chiffchaff (today’s total of 1!) the odd Willow Warbler and Blackcap. John F. Cooper has been compiling seawatching totals, which during the last 24hrs of SE winds, have been rather productive. They can be seen here. Part of a c70 strong flock in the set aside field photographed on the 3rd. There were also paired up birds collecting nest material on the headland today. I can’t imagine this huge social flock contain birds that are also holding territory in the gorse. So it’s interesting to speculate as to whats going on. A dusk visit to West Rise in the 5th produced a single Common Tern hawking over the lake and c10 Sand Martin flew through shortly before sunset. An overcast morning with a light to moderate SW wind, overnight conditions were similar. According to The Bird of Sussex it equals the earliest county record, also at Beachy Head on 2nd April 2002. I visited the old trapping area, Belle Tout and Birling Gap. 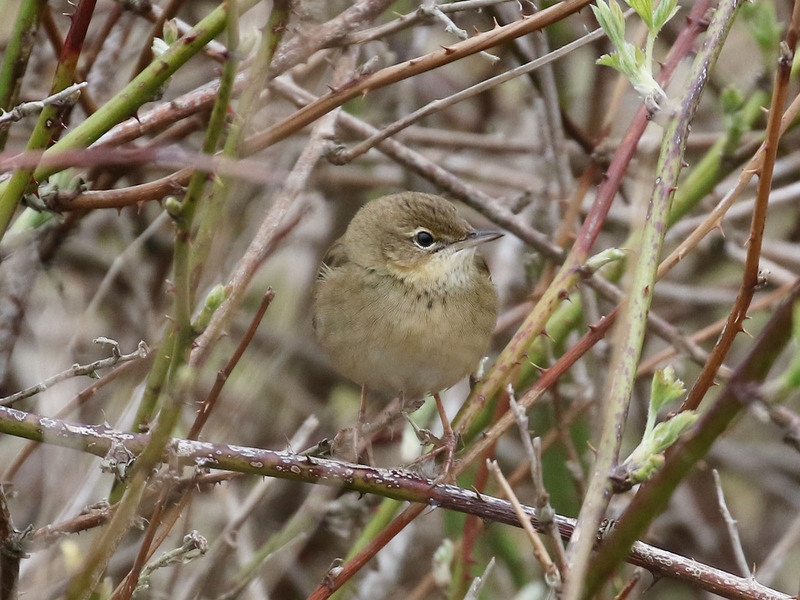 The real surprise of the morning was hearing the familiar insect like song of a Grasshopper Warbler from a pitiful patch of brambles right next to the road below Belle Tout, certainly my earliest ever. The bird showed briefly but mainly sang concealed in cover. 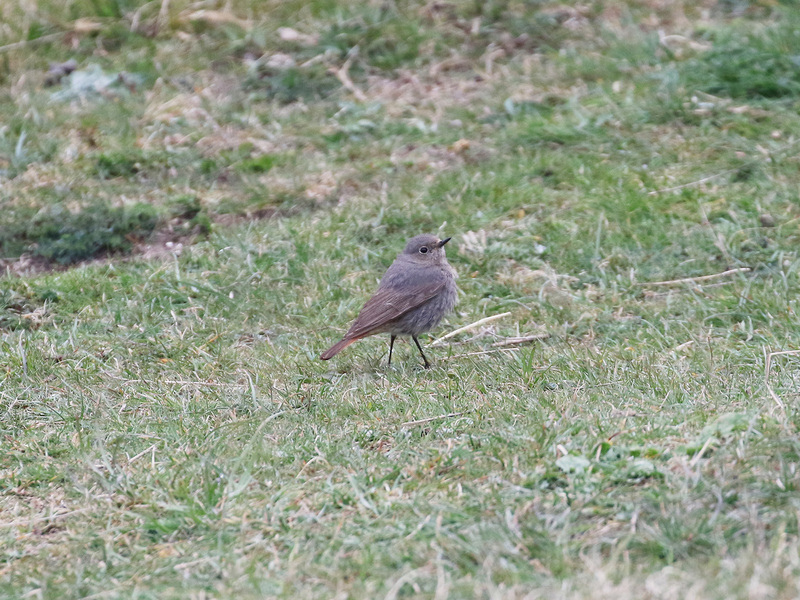 Quite remarkably this is my first on the headland since 2017! 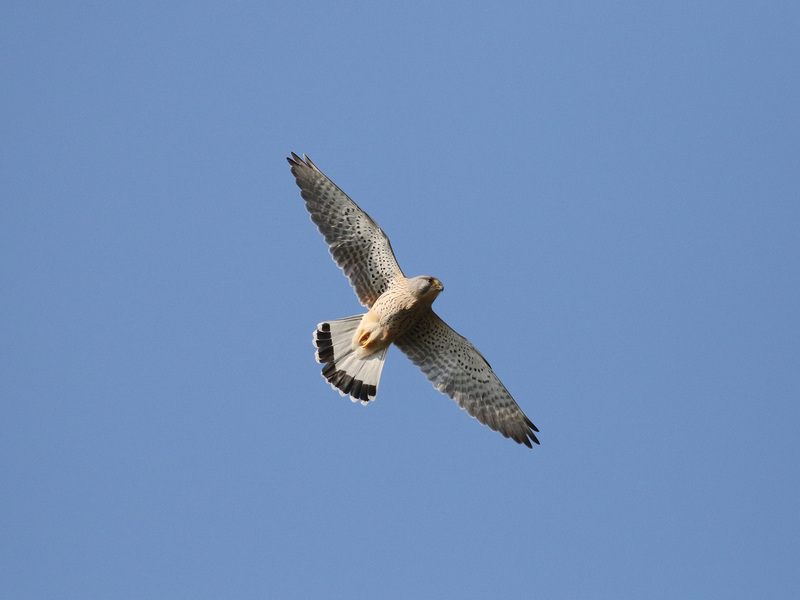 Although there was no shortage of sightings and birds trapped last autumn I failed to see a single one. Looking towards Belle Tout from Shooter’s this morning. 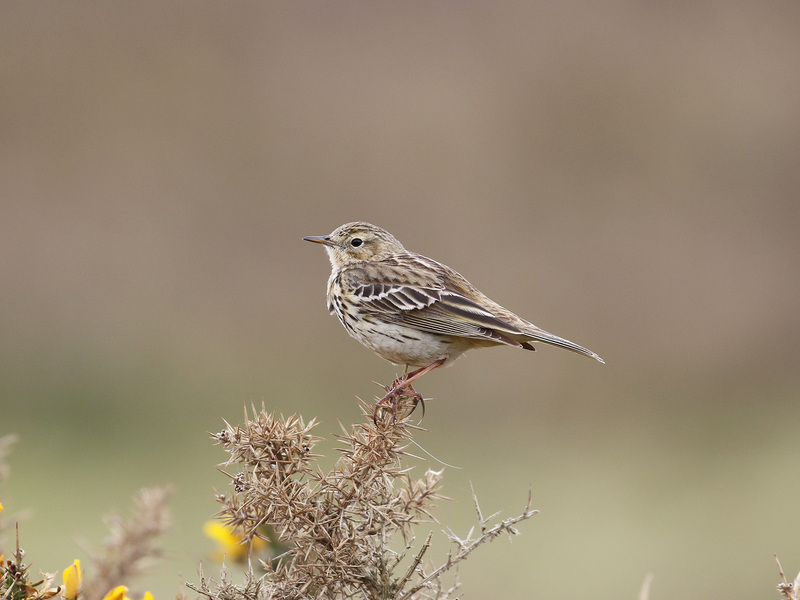 A trickle of c40 Meadow Pipit arrived from the south, 80 Linnet (the bulk of which was a flock of c50 in the set aside field, which had increased to 70+ birds by dusk). Obvious migrants included c10 Chiffchaff in various spots and a singing Willow Warbler in Belle Tout Wood, 2 female type Black Redstarts in the vicinity of the lighthouse, a single Redwing in the wood. RE also had a singing Sedge Warbler in the Hollow. A cursory glance out to see from the top Birling Lane produced a passing flock of c35 Brent Geese, whilst a pair of Shelduck were still checking out the cliff top rabbit holes as potential nests sites. 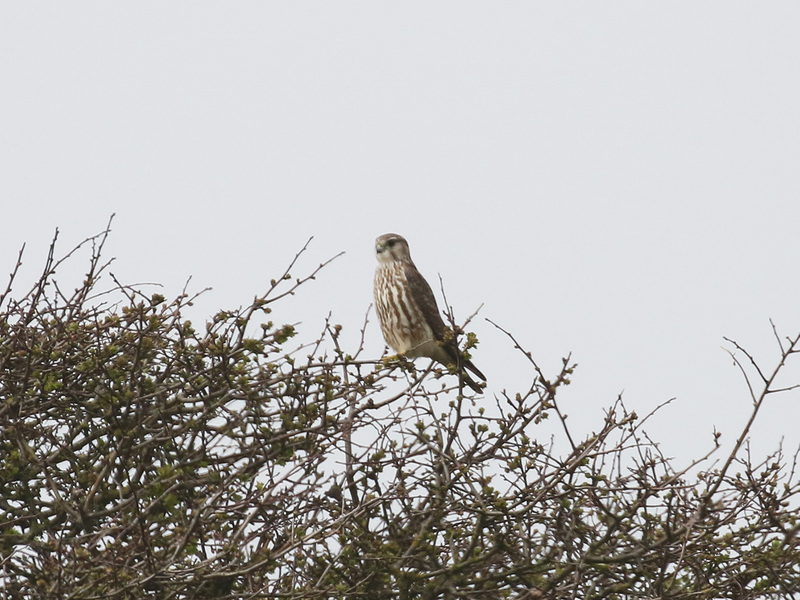 A lone Peregrine and single Sparrowhawk also noted. A brief afternoon visit, with yesterdays fine and calm weather abruptly ended by the arrival of cold front, bringing a cool, stiff NE wind and patchy cloud by my arrival at 4pm. 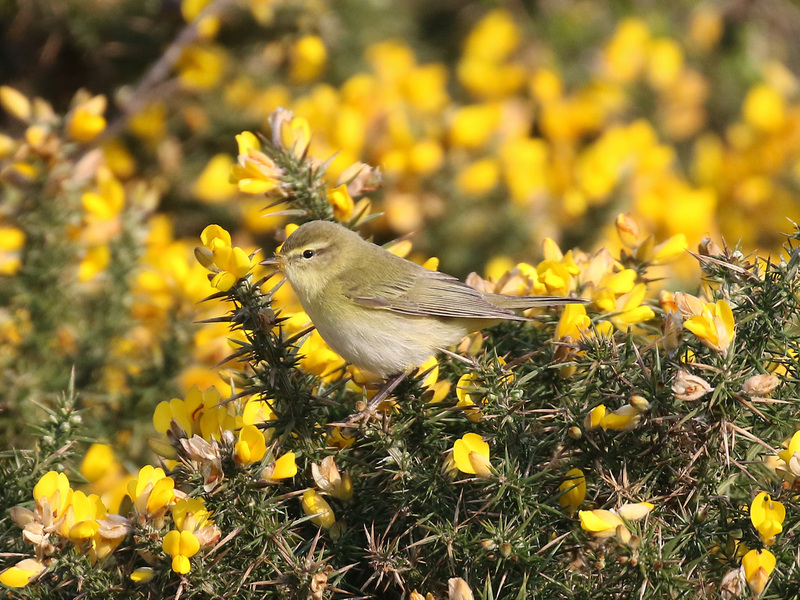 Willow Warbler below Belle Tout. 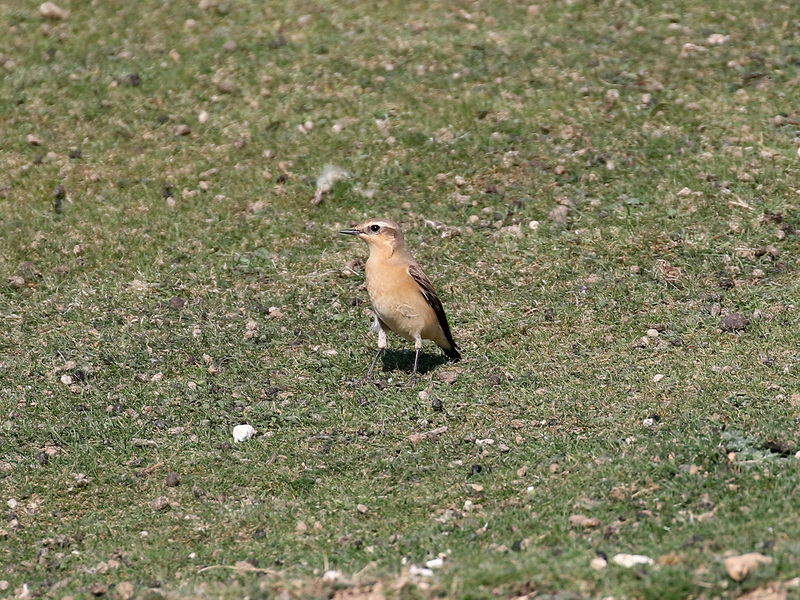 A walk from Shooter’s to Belle Tout return produced two new spring additions to the year. 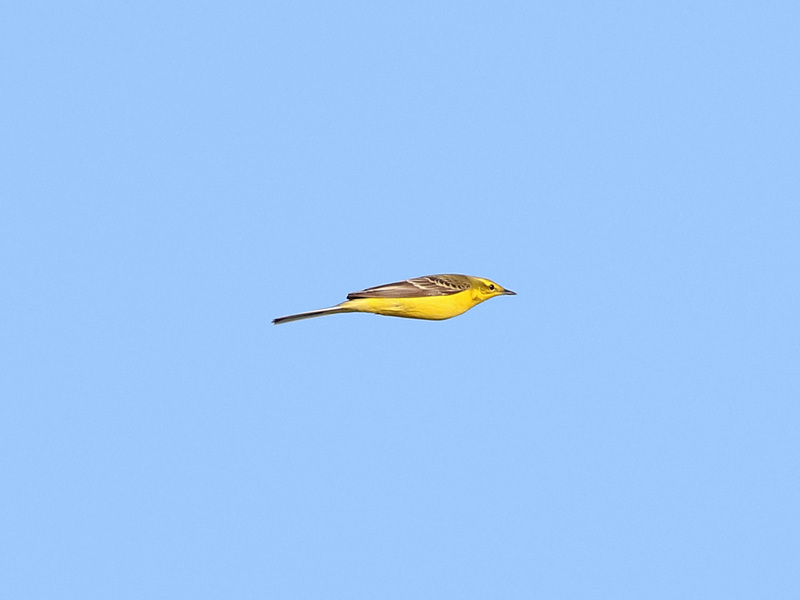 One being a Swallow, which flew low over Hodcombe, the other 2 Willow Warbler in scrub below Belle Tout lighthouse. Along with them were 3/4 Chiffchaff and a single male Blackcap. A clear night and morning very light E wind that was almost imperceptible at times. 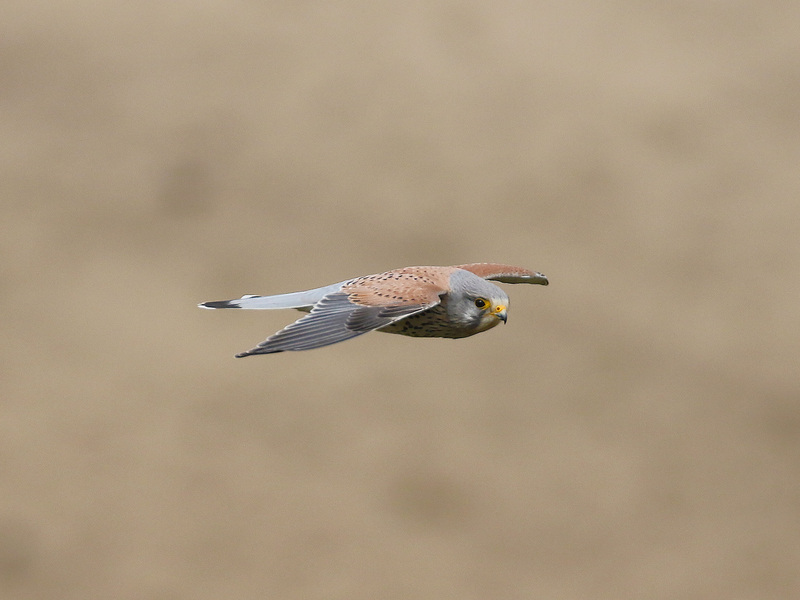 A male Kestrel this morning, one of a pair here at Beachy Head. I saw them copulating about three weeks ago so hopefully they’ll breed again this year. I assume it was their progeny of 4 juveniles I saw frequently hunting together near Shooters Bottom late last summer. Very slow, migrant highlights were 5 White Wagtail, 3 Chiffchaff and 3 Goldcrest. Again c120 Herring Gulls and two Adult Mediterranean Gulls in the ploughed field at Birling.